If the gunfighters from the wild west had only ordinary revolvers, today's automatic laser-targeting guns are something special that villain and sheriffs have not even dreamed of. The horoscope for June 2018 tells the Aries that they will be able to rely on their exact but metaphorical "gunsight" that will allow them to reach very ambitious goals. The horoscope anticipates success in work and love that you choose and focus on. June 2018 will make Taurus a great observer. Maybe your spouse or a loved one need new pedals for his / her bicycle to make an easy ride, maybe someone related or a friend cannot do without your help and reassurance. Maybe it's also you, Taurus, who will be able to estimate moods of your boss, distinctively better than others. Thus at work you will support the team spirit and pull all colleagues together. Taurus should be self-confident, but don't forget to look around before proceeding forward. Gemini, June will pump the blood in your veins. You are ideally tuned to make the most of your driving talent. The horoscope recommends testing the skid school, if you accidentally won't go straight to any of the Formula One team, or if you don't plan to shoot other parts of the popular BBC Top Gear series. But seriously, the horoscope suggests in particular that the heart beat of Gemini will increase and that your appearance will become more appealing in June. But you don't need a team of engineers or fashion consultants – rely on a sustainable desire to change and you will feel lucky every time when looking in the mirror. Cancer, the horoscope for June 2018 shows that love and emotions will be shaking your heart, at least as hard as you would try to get a black belt in Judo and a week later try to win the World Championship in this demanding Asian martial art. All you have to do is stick firmly to what (or whom) you believe. Even so, be prepared for your heart being exposed to emotional pressures that can be as strong as a true lorry. Cancer should also expect that whoever is exhausted or blinded, will be deaf to all arguments, even to the most self-evident ones that are clear as the sun in the noon sky. Even Leo is entitled to have proper rest at least once a year. June will be lazy. Leo will be overwhelmed by the desire to let the sea waves wash your tired feet. But if there will not be a suitable place on any of the sandy shores, Leo must look for rest and new inspiration in the comfort of your current neighbourhood. When you can't move your body in June, you still have plenty of fantasy in reserve. The life of Leo is like a note that seeks the right harmony and its place (chord) on the outline of life. The horoscope reminds Virgo that sitting in a dark cave is not what would make you happy. However, Virgo should know that important is not only how the adventure begins, but, above all, how it evolves. The hunt for the dragon and the liberation of the princess can begin with the boring scene somewhere in the lonely countryside. The horoscope for June 2018 looks figuratively like a colourful blanket or, yet better, as a genuine oriental carpet. According to the horoscope, Virgo can expect a month of varied experiences, allowing to enjoy a heavenly feeling (such as flying on a flying carpet) at the very end. And again, your digestion! Libra people should be prepared for the worsening of digestion in June. A corpse can float for a long time in river, but your stomach is not a part of a detective story; you simply should avoid fatty and caloric food that may easily stuck in your stomach. The horoscope for June 2018 encourages Libra to be careful about eating. Pamper your body because it is not a system of indestructible titanium pipes, but rather a symphony orchestra, where it is easy to recognize that someone is playing out of tune. Scorpio, the best tomato is red, juicy, sweet and torn directly from the plant on which it grows. However, growing such a tomato takes a lot of time and energy. Positive mind and above all patience will be key to Scorpio in June 2018. According to the horoscope, Scorpio should also delegate some of his or her tasks to others (subordinate, friend, spouse ...). Don't be afraid and don't hesitate to leave some important "burden" to your husband or wife (troublesome purchase etc.). Mutual tasks will only strengthen your love. The June horoscope brings an impulse for people born in the sign of Sagittarius to start dismantling the walls that were build around them for a long time. This regards primarily the field of communication. Sagittarius, think about whether your relationship with the beloved counterpart, parents or children, or friends, is the same as it was a year or two ago. Perhaps a certain barrier has emerged unconsciously and actually unnoticed, which is now the best time to break down and make an important step towards restoring a harmonious relationship. 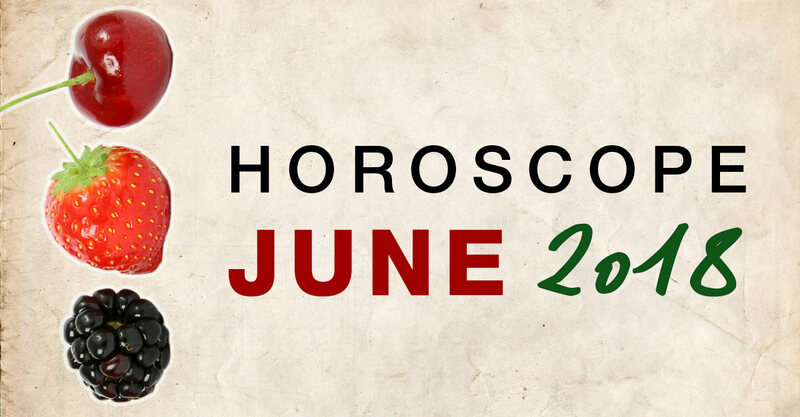 June 2018 will definitely be a period full of satisfaction for people born under Capricorn. The horoscope tells you that your long-term struggle will come to an end and your effort will be rewarded during the month of June. When you reach deep into your pocket, you will find a gold coin there. No, it's not a fairy tale. Although in truth – a gold coin can also be a synonym for happy love and relationship. What considers your work, Capricorn will succeed as a supervisor, as a part of a strong chain. Aquarius, the world is waiting for you with open arms in June and it will also welcome and appreciate your talent. Have you got your fingers burned? Let's say, have you experienced a bad trip to the sea, or was your computer hacked by a Russian email, or are you the Aquarius with broken heart (thanks to a foreign love affair), or were your savings stolen from the international stock fund – whatever unpleasant has happened, do not despair, the horoscope tells that June 2018 is the month when luck will come and replace the bitter disappointment. Ideas from Eastern philosophy will inspire you this month. There is no comfortable chair at the end of long journey, but your endeavour resembles more a winding footpath that is accompanied by a visit of your mother-in-law, an interview with the boss about possible salary rise, or the jokes of your close friends about your mood swings or unathletic figure. Pisces, the June horoscope symbolizes a dance that you need to feel; a rhythm that you have to learn and follow. Unfortunately, Rigid people born in Pisces have no chance.